Aubert appears in the 1900 US Census, living in Weehawken, New Jersey, age 43, born Switzerland, Oct. 1856, immigrated 1871. He lists his occupation as "Manufacturer." The business was located on this corner of 14th St. from around 1898 to 1911, having started downtown on Canal St. some ten years earlier. In 1911 they moved around the corner to 405 W. 13th St. where they stayed until the late 1920s. In 1926 Aubert Boxes moved to 47 9th Ave. on the NW corner of 14th St., then went out of business around 1928/29. By 1930 Aubert had retired to California. Aubert's sons, Charles Aubert (1894-?) and Louis A. Aubert (1891-1969), were associated with him in the business from around 1915. The Kelly Building is named for its owner, Arthur H. Kelly (1872-? ), a wholesale produce merchant who lived in Brooklyn. 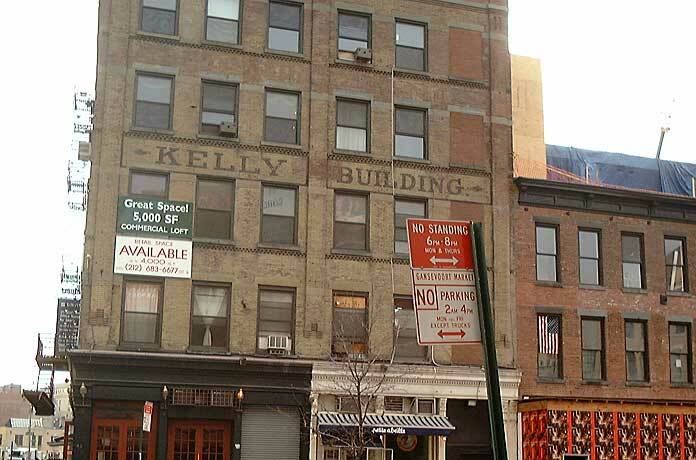 Although Kelly owned the building from some time in the mid-1920s, the Kelly Building sign is later in date: a vintage photograph from around 1940 shows the building with Greenwich Mills Co. painted across the front. The Gansevoort Market Historic District Designation Report (New York City Landmarks Preservation Commission, 2003, pg. 237) gives the following information on 400 W. 14th St. (aka 37-45 9th Ave.): "Date: 1886; Architect: Joseph M. Dunn; Builder: Marc Eidlitz & Son; Original Owner: James Alfred Roosevelt; Type: Warehouse; Style: neo-Grec; Stories: 5; Facade Materials: brick, stone, cast-iron storefronts." The report lists "Arthur H. and Elizabeth M. Bannin Kelly" as owners from 1923 to 1987, but does not include Henry Aubert in its list of commercial tenants. "H. J. Fischer / Greenwich Mills Co., coffee and tea" were tenants from 1938 to 1946. 400 W. 14th St. was constructed with cast-iron shop fronts on the first floor. The foundry marks for the firm Cook & Radley / Murray Hill Works appear several places along this first floor facade. For more on Cook & Radley see http://www.waltergrutchfield.net/cookradley.htm.